There’s nothing wrong with ambiguity and/or subtlety in horror films. One of my all-time favorite fright flicks (and one that’s on a lot of other people’s lists, too) is the 1963 Robert Wise classic THE HAUNTING, a film in which much is left to the imagination, and the true cause of the terrifying goings-on are open to interpretation. Sometimes, though, subtlety can go too far. Case in point, Ben Ketai’s recently released BENEATH. The basic premise is a good one: tomorrow is going to be the last day on the job for coal miner George Marsh (Jeff Fahey). At his retirement party, his daughter Kelly (Samantha Noonan), and attorney, lets it slip that her main area of practice is environmental law. She takes a fair amount of ribbing over this from her dad’s co-workers, not all of it good natured. After much drinking at dad’s party, Kelly agrees to go down in the mines to see what it’s really like. But when a mine shaft collapses trapping Kelly, George, and the rest of the miners (including Kelly’s ex, Randy (Joey Kern), it’s anything but an ordinary day on the job. Running short on oxygen and supplies, the survivors of the collapse head for the rescue shelter. However, the sound of voices in the distance sends them back out in the hope that maybe a few more miners are still alive. After a fruitless search, the miners return to find that someone (or something) has destroyed their oxygen tanks. Some of the survivors are starting to act strangely, too. Is it just oxygen deprivation, or is something more sinister at work? While BENEATH remains a more or less engaging thriller for its 90 minute running time, it’s so intent on obscuring what, exactly, is going on that it forgets to bring the horror. Sure, there are a few effective scenes, and just the idea of being trapped in a mine is in itself pretty frightening. But this is a film that gives every indication of being a monster movie, and then never gives us the monster. Too bad, because there are a lot of things to like about this movie. It’s a very well made film that does a good job of generating suspense and a feeling of claustrophobia. The cast are all first rate, too. And it’s just nice to see a working class horror movie in the vein of John Carpenter’s THE THING or Ridley Scott’s ALIEN for a change. Everyone works so hard to make this a good movie that it almost works. 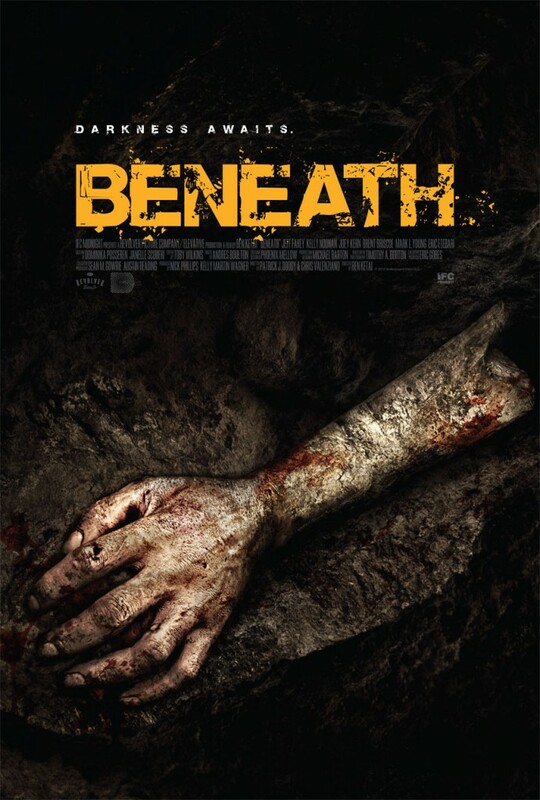 But as much as there is to like about BENEATH, it still leaves the viewer feeling short changed. 2 ½ out of 4 stars.